If a member has to miss a performance, a parent must contact the director via phone or in person at least two weeks before the planned absence AND submit a note to the director. Please mark your calendars well and avoid conflicts by planning ahead and communicating clearly with the director and other advisors/sponsors/coaches. It is the responsibility of the director to notify students as far in advance as possible of rehearsals and performances, and it is, in turn, the responsibility of the student to arrange his or her schedule. Why Should I Join Marching Band? • We entertain the crowd at every football halftime and cheer on the team in the stands during the game. Members are admitted free to every game, and transportation is provided to away games. 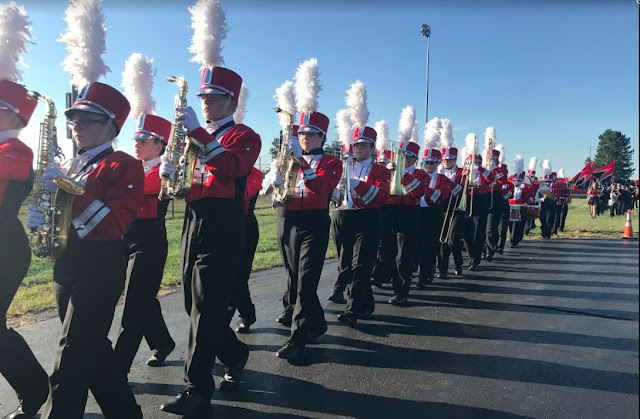 • We perform at several parades and compete in statewide competitions where we will see and go up against some of the finest bands in the state. You will be able to see the universality of marching band and meet members of other bands. • Our group has SHARP uniforms! They are the best quality available and are comfortable and flexible. You will look good and feel good in them! • Marching band is an excellent social activity. You will spend many hours with your friends in the band at games, contests, parades, and rehearsals. We pride ourselves on the family atmosphere that is present in our group. • Marching band is not just a musical experience, it is learning experience. You will learn that personal excellence equals group excellence, that hard work pays off with substantial rewards, and that with desire, determination, and dedication, you are capable of accomplishing any goal you set for yourself! Here’s a rundown: If you are a first year member, you must get a summer uniform, which includes an official band shirt (provided free of charge this year). On your own, you must have or get an all-black pair of shorts, white socks, and a pair of mostly-white athletic shoes. Your official full uniform is yours to use at no cost, except for a $25 pair of official marching shoes. There is a $30 school fee that helps offset the cost of travel to contests, festivals, and parades. The only other cost is your band camp fee of approximately $120 which covers five days food, your FMB Tshirt, all social activities, and instruction. You must have a deposit of $50, cash or check, to the boosters no later than April 10. There is a fundraiser in April and May for all band members to raise money for their camp. You can pay the balance at band camp check-in on July 29. We rehearse the week of July 16 at the school in the mornings to prepare for camp. Band camp is a full week of team building and rehearsal July 29 to August 3. There are several rehearsals in August before school starts. The band then rehearses Mondays and Wednesdays after school until 5:15. We perform at all Fairbanks varsity football games on Friday nights from August 4 to October 26. We perform at three Saturday events. All of the rehearsals and performances are mandatory and it is asked that band members arrange their schedule in advance to make all commitments. Can I Do Other Things? Absolutely! My personal philosophy is that band is very important part of the education and development of all band members….it is, however, not the ONLY thing. It is possible to play volleyball, soccer, golf, or run cross-country with very few schedule conflicts. It is even possible, however not easy, to play football and do marching band. Mr. Keller will make arrangements with coaches to make sure the students are not caught in the middle and know exactly where they should go on what day. I believe family time is also important, that is why there are only three or four Saturday events during the season. I do ask, in return, families plan their events on non-band weekends, so all members are present for performances. What is Band Camp Like? It’s a week like no other. We put together our contest show and work on fundamentals of music and marching. Members will stay on the FHS campus from 8am to 8pm and lunch/dinner will be provided. Social activities will be held daily as will spirit events. We have two full field rehearsals a day in the morning and evening, and have music rehearsals in the afternoon. It’s the hardest week of work you’ll ever love. If you have any questions about what camp is like, contact a veteran member! Is there hazing or initiation? The Fairbanks Marching Band is a non-hazing organization. From your first rehearsal, you are a full-fledged member of the organization. We take great pride in our family-like atmosphere and all members are treated fairly with the respect that they deserve. We play traditional school and patriotic music at our pre-game performance, and explore many genres during our halftime show. Our focus is on learning about music through performance, and presenting an entertaining show for every audience for which we perform. This year's competition show will be determined very soon! At a band contest, we perform our show for a panel of judges who rate us on musicianship, marching, and general effect. Trophies are given and ratings are awarded. The top bands in the state move on to state competition. Contests are an excellent way to strive for the highest, and see the universality of band membership. They are a very important part of the overall music education and are an excellent opportunity to show our pride in our organization. Parents, family, and friends are welcome and encouraged to attend and support our band. In coming weeks, all band members will receive an invitation to join the “Remind” application. All fMb parents and members should sign up for this service for regular updates about marching band events. Using the Remind app on your smart phone is the best method, but you can also sign up using email or text. There will be a meeting for parents of 2018 marching band members on Tuesday, April 10, at 7pm in the high school band room. This meeting will only last a brief time but will cover some very important topics relating to you and your FMB member. I need at least one parent of every marching band member to attend, including rookie AND veteran parents. After this meeting, you may also pay your $50 band camp deposit and ask questions that you need answered from the boosters and Mr. Keller. Please mark you calendars and plan on attending. If you cannot attend on this date and time, please contact Mr. Keller to arrange an individual conference so this important conversation can take place. It is imperative that a representative of your family attend this short meeting on April 10. Thank you, moms and dads, for your continued support of our fine Fairbanks musicians!